The Devers–Palo Verde No. 2 Transmission Line Project is a 230-mile, 500-kilivolt (kV) electric transmission line routed between Devers Substation in California and Harquahala Generating Substation in Arizona, as well as 41.6 miles of new 500-kV transmission line routed between the Devers Substation and the Valley Substation in the Romoland area of Riverside County. In total, the project, as proposed by Southern California Edison (SCE), spans approximately 272 miles and traverses multiple jurisdictions, including federal land administered by the U.S. Bureau of Land Management (BLM) in both California and Arizona, the Kofa National Wildlife Refuge in Arizona, the San Bernardino National Forest in California, the Santa Rosa and San Jacinto Mountains National Monument in California, and private land in both states, as well as lands under various other jurisdictions. Aspen prepared a joint Environmental Impact Report (EIR) / Environmental Impact Statement (EIS) for this project. The Draft EIR/EIS was comprised of three volumes and more than 2,000 pages due to the size and complexity of the project. In support of the EIR/EIS, Aspen conducted biological and cultural surveys along the project alignment in both Arizona and California. Aspen also coordinated closely with agencies and other parties associated with the project, including the U.S. Fish and Wildlife Service, California Department of Fish and Game, Refuges, Native American tribes, and multiple city, county, state, and federal agencies. Aspen provided extensive public outreach coordination for the EIR/EIS, including: eight public scoping meetings held in California and Arizona; management of the mailing list for properties along proposed and alternative corridors; mailing 2,500 copies of notices; organization of six Informational Workshops and three California Public Utilities Commission (CPUC) Administrative Law Judge Public Participation Hearings. Over 400 pages of comments were received on the Draft EIR/EIS, with primary issues of concern including potential impacts to biological resources such as bighorn sheep and other desert species (particularly through Kofa National Wildlife Refuge), habitat loss, visual resources, cultural resources, wilderness areas, and recreational opportunities. The CPUC approved the proposed project; however, the Arizona Corporation Commission did not approve the project. Therefore, SCE filed a Petition for Modification of the CPUC’s approval, requesting that the CPUC authorize SCE to construct facilities in only the California portion of project. 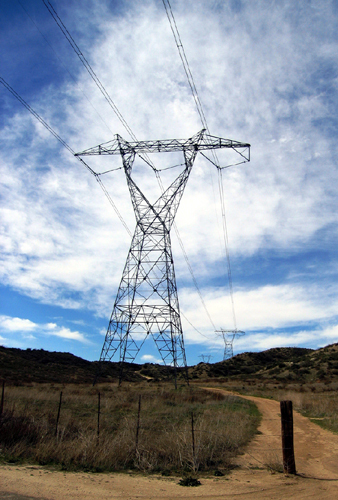 The CPUC approved SCE’s request to modify the project. Following the CPUC’s approval of the California-only portion of the project, several large solar power projects were proposed in the Blythe area. Two of these projects, the Blythe Solar Power Project and the Genesis Solar Energy Project, requested interconnection to the electricity grid at the Desert Southwest–Midpoint Substation. As a result, the solar developers and SCE developed a plan to expand the Midpoint Substation, now known as the Colorado River Substation, in order to accommodate these interconnections. These solar developments were evaluated under CEQA and NEPA, but the environmental analyses did not adequately address expansion of the Colorado River Substation. Therefore, Aspen prepared a focused Supplemental EIR (SEIR) to address specific issues associated with the Colorado River Substation expansion. In particular, the SEIR assessed the potential for substation expansion to result in the consumption of allocated water from the Colorado River, because expansion activities included pumping of groundwater at the substation site, from a groundwater basin that was determined to be hydrologically connected to the Colorado River. Aspen customized mitigation strategies to avoid the consumption of Colorado River water during the proposed substation expansion. The Final SEIR included all comments and responses to comments that were submitted on the Draft SEIR. The CPUC approved one of the site alternatives that was developed and analyzed in the Final SEIR. Monitoring activities conducted in accordance with the project-specific mitigation measures developed for the SEIR have indicated that the substation expansion has avoided impacts associated with the consumption of Colorado River water.